Rubber top aluminum screen printing platens have been an addition that some screen printers are adding to their businesses. In general the aluminum platens tend to last longer than the wood platens and the aluminum is easier to clean. Every flash cure increases the temperature of the wood or aluminum platens. While this causes the wood to change shape over time, the aluminum will retain the heat, but maintain it’s shape. This added heat on the aluminum platen can cause the ink to prematurely cure. However, the rubber tops can be added to help dissipate the heat faster. The rubber tops also give the print a softer finish, making the plastisol ink feel more like a waterbase ink screen print. While the aluminum platens are more efficient, the rubber tops over time will need to be replaced. Make sure to buy replacement rubber tops and when glueing the new rubber tops onto the platen use a high quality glue and try to get the rubber as seamless as possible. If you’ve already made the switch to aluminum platens then it could be beneficial to try printing with rubber tops. If you are happy using wood platens, then by all means, stick with what works for you. 1/4″ Solid Aluminum & 1/8″ Soft Top Rubber is an industry standard on major automatics. 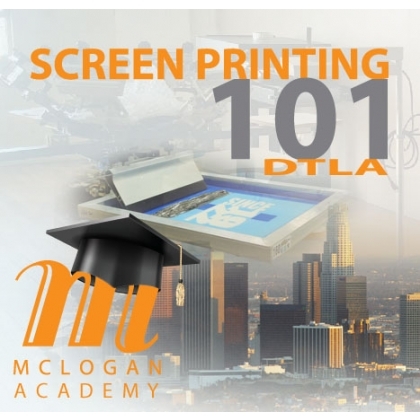 Come try screen printing with aluminum and the rubber tops in our screen printing classroom in Los Angeles. The ink deposit required for a white shirt, instead of a black shirt will cure at different temperatures. More ink is required on a black shirt, because of the white under-base, so that means that you would cure that shirt at a higher temperature. White shirts don’t hold as much heat as darker shirts, so it more than likely that your scorch marks will appear on the white shirts. You want to get the shirt as hot as possible without scorching it, so this is where you need to test out your prints. We suggest that you have a few spare garments to test print and wash before full production. For thinner ink deposit on a white shirt you can cure at a temperature of about 290-300 degrees Fahrenheit. For a standard ink deposit on a white shirt you are usually safe with about 300-310 degrees Fahrenheit. Most athletic jerseys with thicker ink deposit require 340-350 degrees Fahrenheit. Some heat sensitive fabric like spandex, or some workout wear will need a low cure additive like 3804. In this case usually you can correctly cure at 280-285 degrees Fahrenheit. Another product that is helpful is Tekmar Scorch Remover . 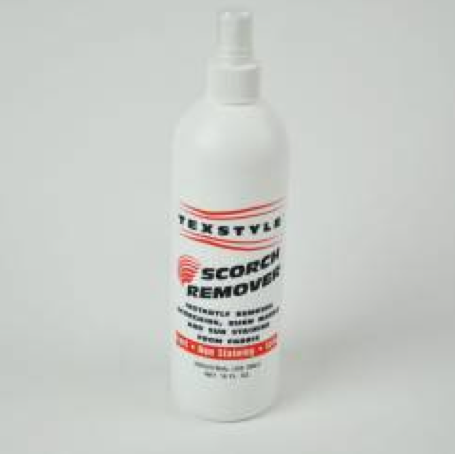 Scorch Remover will remove light-medium burn marks, or sun discoloration. You simply spray the remover onto the burnt or discolored areas of the shirt, and run the shirt back through the dryer. The feel of the print should match the feel of your fabric, so that it feels as though you are wearing a plain shirt. The garment should wash well, shouldn’t crack and be fade resistant. The lines (artwork) should be clean and crisp. Use the right types of inks, additives, and or specialty materials for your design and garment is imperative. The speed, angle and pressure should be consistent for every print. Your own repeated technique/system will be what makes your jobs easier and consistent. Riding the blade of the squeegee on the print edge, through the proper mesh will help you get the cleanest print. Some argue that this is harder to do manually, but again it just goes back to your personal print method. 160 mesh count should be your most common printing mesh. The mesh count tends to see the biggest mistake made when screen printing. Under or over-curing the ink is also another common problem. Also do a test print and be sure to fully cure your ink to prevent cracks. Knowledge and understanding of off-contact printing is ideal. Using a T-square to square the image up properly on your garment will also help for consistent images on the garment. Make sure you stir your ink! Plastisol ink tends to get thicker over time, so always stir it and ensure that it is creamy and smooth. If your ink needs to be thinned then add in an additive. Use screens that are properly/correctly tensioned. Hopefully these tips will help you and leave you with some amazingly good screen prints. In the video below we demonstrate a quick and extremely easy color separation in Adobe Illustrator with AccuRip Black Pearl. Check out how using AccuRIP Black Pearl will make your job a lot easier. Mclogan Supply has recently partnered with Workhouse Products and we are thrilled to be able to offer such high quality screen printing equipment to our customers. 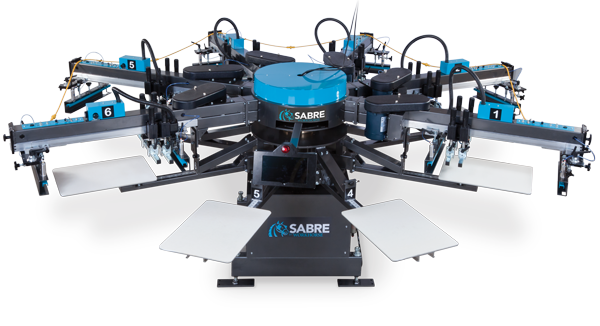 Workhorse prides itself in offering screen printers with durable, well designed machines that are by far the best on the market. Everything from their manufacturing, engineering and production teams involve creating products that are built to last, well thought out designs and made to perform. Workhorse Products have been manufacturing screen printing equipment for over 30 years. It’s their commitment to providing their customers with high quality machines and their valued dealer relationships that have thousands of screen printers choosing Workhorse as the top manufacturer in the industry. Mclogan’s is excited to now sell ALL Workhorse Screen Printing Products. Packages start from The Odyssey Series, which is for start up business, to The Mach Series designed especially for professionals. Conveyor Dyers, Exposure Units and even Automatic Screen Printing Presses will now be offered online and in all 4 stores. Come into Mclogan LA and test out The Mach Series in our classroom to see why Workhorse on the market. Film Output Systems are an essential key to any screen printing shop. It’s this major step that allows you to transfer your artwork to the screen. When you have turned your design into a film positive, you will print it with black ink on clear waterproof film. This positive print will block out the light during the exposure process. If you don’t have a clean, dark film positive you will lose the crisp, clean look of your design. The darker your positive the better the image will wash out on your screen, and this is why your film output system is crucial. Epson 1430 All Black Ink Film Output Package The 1430 can print 13 inches wide and comes with 6 black ink cartridges, AccuRIP software and 200 sheets of waterproof film. Easy to set up, and affordable while still offering Epson’s amazing quality prints. Epson 490o All Black Ink Film Output Package This 17 inch wide printer comes with AccuRIP Pearl, 11 cartridges of black ink, waterproof film and free shipping. Epson T-3270 Output Package The new SureColor T-Series printer deliver presentation quality print at 24 inches wide. Copy, scan and the share feature are best-in-class speeds saving you time and money. Paired with AccuRip Black Pearl SE to create an amazing output printer for automatic press printing shops. 24 inch by 100 ft roll of waterproof film also comes with this package. Call Mclogan Supply today to speak to a sales associate and start printing your positive the right way! The process of degreasing your screen with Franmar Degreaser to remove all the grease, dirt, dust and oils before putting on your emulsion is crucial. This step is important and one that some beginner screen printers don’t do. If this is a step that your normally skip, then your emulsion will not adhere to the screen causing pinholes to your design. If there is any grease, or oil on your screen your emulsion will just fall off of the screen, leaving you with a poor image resolution. It’s also just as important to have a dedicated scrub pad just used for degreasing. When you properly clean and rinse your screen then you will have complete adhesion, a great image quality, and a stencil that will last during your production hours. Here’s our YouTube video showing how to properly degrease and rinse a screen. Block-Out Tape is solvent resistance, conformable to screen corners, highly adhesive yet easy to remove without damaging your screen. Once you put your emulsion on the screen, using block-out tape is your next step. Blue Block-Out Tape is essential for every screen print shop. You’ll use it to cover the 4 sides of the frame/screen and corners, front and back to block ink from passing in unwanted areas. Hide the registration marks with the clear tape, so that you can still register your artwork. Watch this quick video to further explain how to use block-out tape. Off contact screen printing is the space between the substrate and the printing side of your screen. This type of printing method allows the screen to only touch the garment lightly when the squeegee is pressing the ink through the screen. Off contact height levels are determined by the fabric of your garment and can range anywhere from an 1/16 of an inch to a 1/4 inch. Watch McLogan’s video to see how to set up your screen for off contact printing. 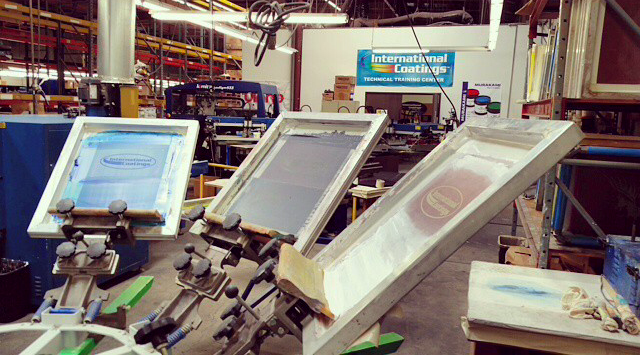 McLogan Supply helps hundreds of customers a day with questions about screen printing. We have found that most of the questions we get asked are very similar in scope. Most revolve around how to start and build your own screen printing company and how to troubleshoot exposure and printing issues. With so many questions we have decided to offer an educational course on screen printing.We are thrilled to announce that we are now offering monthly screen printing classes. Attend our Screen Printing classes Academy and learn everything you need to know about screen printing. McLogan now has its own education room, dark room and we have an experienced and knowledgeable staff teaching the class.Ross Hunter has his own thriving screen printing, graphic design, and embroidery business. He specializes in marketing and training within the field, as well as management of the day to day operations. Let him teach and inspire you how to create/operate your own business. Classes will be monthly on Friday & Saturday from 9am-5pm at our Los Angles location. The upcoming screen printing classes’ dates are all listed on our website. Introduction to Art; Vector art with Photoshop, Jpeg, tiff, and bmp, spot color, separations, 4 color process, and assorted graphic programs. Films and Output; Why an ink jet printer? Inkjet RIP, plotters, density req. Screen Preparation; Frame & mesh selection, pre-stretched wood versus aluminum and pre-production paperwork. Setting up a Screen room; Racks, lighting, dehumidifiers and environment. Pre-press; Degreasing, emulsions, coating, drying, exposure and block-out. Setting Up a Job & Printing; Print order, registration, strike-offs and printing techniques. 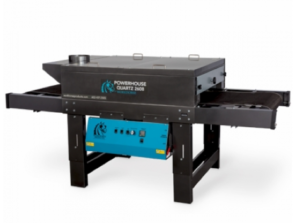 Curing Parameters; Flash temperatures, final cure parameters and testing. Production Tracking; Final counts, cleaning garments, misprints and filling out production reports for job repeatability and consistency. Additional Tips & Advice; Print placements, Photoshop separation guide, blends, puff ink tricks, curable reducers and assorted short cuts. Class size is limited to 12 people, so sign up online to reserve your spot! We look forward to further helping you reach your business goals and to establishing a great business partnership. See you in our education room soon!